Week 2 pet challenge from Hope* the Happy Hugger. Ya gotta ask yourself, am I feeling lucky today? Well, are ya punk? 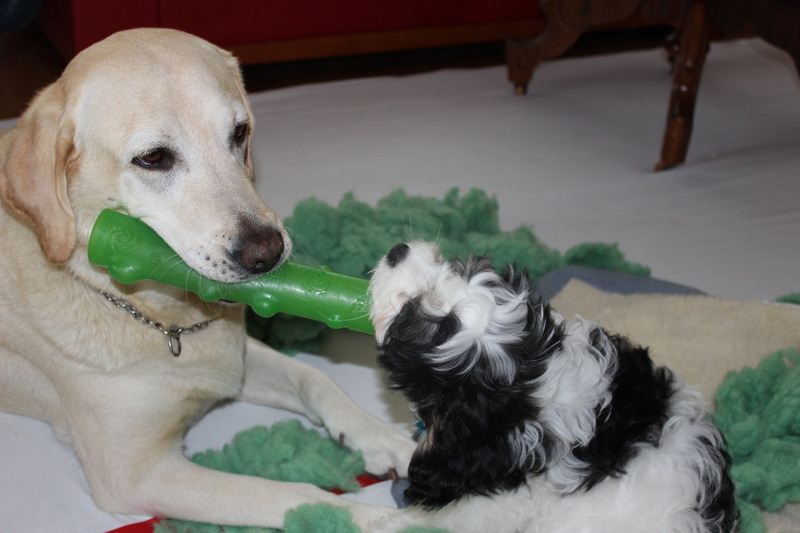 This entry was posted in Family and tagged Clint Eastwood, dogs, Michelle's Weekly Pet Challenge, Tug of war. Bookmark the permalink. You know you are getting old when you miss a cute dog photo. Like your caption too. Gracie is showing her age. How old is she? Scrappy is 11 or 12–not sure because I adopted him. Queenie is nearly 9 now, but is quickly getting a white muzzle. I think she is trying to look like her owner. I know what you mean. They occasionally talk me into a three way tug contest. Adorable girls, Al. Sibling rivalry? So who won? Love those two! I was going to ask that… 😦 Such a ‘diplomatic dad’ answer! What can I say? I’ve mellowed in my golden years. I thought sponsoring dog-fighting was curmudgeonly. They give us back three-fold in love and entertainment. Never a dull moment, as you know. The patience of mothers is never exhausted. There definitely is a mother/daughter thing going on there. Bella doesn’t suspect they are different breeds. Thanks, Jane. The lab was gentle and accepting of the puppy right from day one. I’m still careful to give her lots of individual attention as a reward for her patience.